Alfred E. (Irv) Nelson's recollections of camp life are similar to John Buskowiak's. The following excerpts from an oral history with Mr. Nelson tell of long days of hard work, punctuated by bountiful meals, recreational activities, and educational opportunities. I don't recall the exact time we got up, but it seems like it was 6 or 6:30 and then we'd get our call to wash up and then we'd get the call for mess in the morning. After breakfast we had to go back and make up our bunks, clean up the barracks and be out to the muster area for our day's assignment by I suppose quarter to eight, or eight o'clock. It was a pretty close schedule. Nelson enjoyed the team sports available to the men, and the camp’s close proximity to a lake. We had our teams; we had a basketball team, softball team, football and they played amongst the other camps - one camp would play another camp and we had some of the boys that were even on the Blackduck team. Blackduck played Bemidji and beat them - I have records of that. Well, we did quite a lot of boating; we made our own boats there. Claire Rollings got plans and made these kayak-type boats. Swimming and fishing, we had very good swimming there. In the evenings, CCC employees could take advantage of an assortment of educational opportunities, as Nelson discovered. They had a very good educational program. Our educational adviser all the time I was there (two years and one month) was Claire Rollings. Claire Rollings was probably the boys' best friend in the company - he got them any kind of education about that they wanted to get. If he couldn't teach it there he got these…school teachers for the boys. It was a very well equipped school - it wasn't the best of everything but it was very good. And the boys spent a lot of evenings there and Saturdays and Sundays, leisure hours, and the school was equipped with woodworking tools, typewriters, motion pictures, projectors, they showed a lot of educational pictures in teaching, and forestry classes, woodworking classes, diesel engines, mechanics. There was a Junior Audubon Club, they even had garden clubs during the summer. 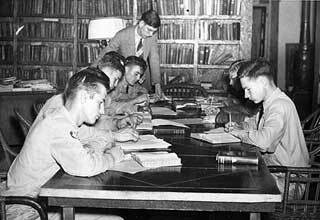 Adult education program at Civilian Conservation Corps camp, Maple Lake, 1938. 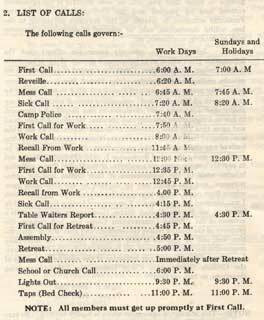 Daily schedule from CCC Handbook, Company 3707, Camp F-53, Two Harbors, Minnesota, 1939. The call for morning mess at a CCC winter camp, 1934. 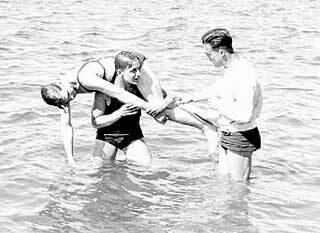 Life-saving methods demonstrated to Civilian Conservation Corps (CCC) boys, 1936. 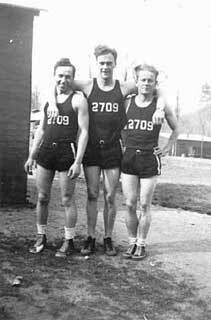 Photo: Basketball players, CCC camp, Whitewater, 1940. 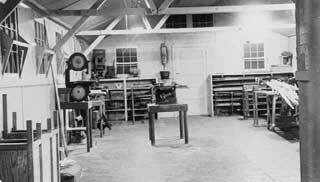 Photo: CCC camp workshop in Minnesota, 1936-1938. 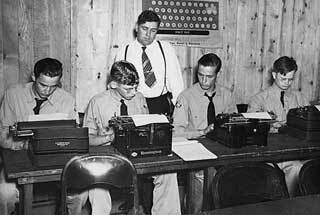 Photo: CCC enrollees learning to type, Maple Lake, 1938.